Restaurant franchises, soup to nuts. Dig into restaurant franchising and do it right with our comprehensive kit of essential documents. 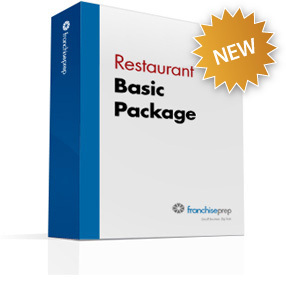 Includes easy to use templates for your franchise disclosure document, franchise agreement, and operations manual—plus a special template for your restaurant opening manual. For service industry and retail franchises, please see our standard Basic Package. Franchise Disclosure Document and Franchise Agreement Templates Templates for the two most crucial legal documents you need—lawyer-edited and FTC-compliant. Learn more. Operations Manual Template The "bible" of your business. With a template that is specifically for restaurant franchises, we make it easy to include everything your franchisees need to know to run things the way you would. Also included is a helpful Restaurant Opening Template. Restaurant Franchise Disclosure Document Attachments Sample Give yourself an advantage. Our Restaurant Advantage Package contains everything in our Basic Package, plus our exclusive franchise development tools to help you launch your franchise and ramp up fast.